Made with sterling silver, the North Star necklace will safely guide you home to where your heart belongs. Using the famous purple stone that is known for its properties to clear one’s mind, this bottle stopper makes for an elegant gift for your tasteful friends. This watch pairs beautiful deep green sandalwood with a rose blush face to create a warm, feminine touch. Also available in men’s or unisex models. This fragrant gift box includes three of the brand’s signature scented candles, all made from imported essential oils. The French designer label's newest Christmas gift set includes the signature creme de Marie, Miraculous detox paste, green tea dew and a MUMU pouch. These vintage woolen Christmas sweaters made in Japan or Italy are great icebreakers at parties during this time of the year. And who knows, you might even find the love of your life at one of those, just like Bridget Jones did. If you’re heading back home for the holidays then these Chinese-inspired Christmas stockings by Pinyin Press would be the perfect gift for friends and family. Stay warm with these winter essentials from Plastered 8 and check out other Beijing-inspired design products from their WeChat Store. Made with 100 percent Italian cotton flannel, RJ Clothing’s latest shirt collection brings a diverse range of colors and patterns to your wardrobe while keeping you warm. Need last minute Christmas decorations? We've got you covered! 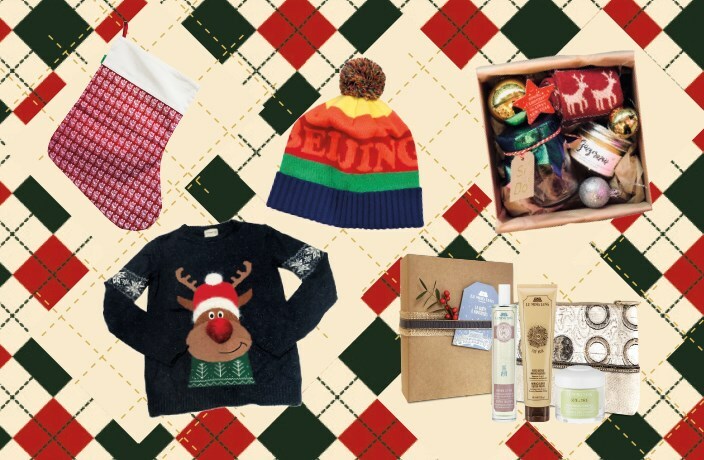 Deck the Halls with These Festive Christmas Items! Whether you need decorations or fun favors for your next holiday party, we've got you covered! Get into the Christmas spirit with these festive costumes and trees! Need a Christmas Tree? Here's Where to Order One in China! If you're looking for a new 'Tannenbaum' to be the centerpiece of your Christmas décor, check out these Christmas tree sets! Deck the halls with holiday cheer this Christmas season with these festive Santa costumes for men and women! Delivery times are as low as 30 minutes, as long as you live close to a store. Watch sports history unfold in real time while on the go or from the comfort of your home.